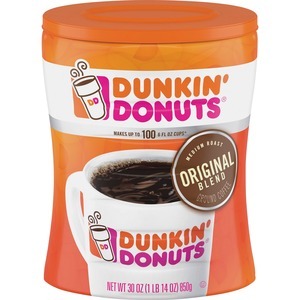 Original blend coffee brings you the same great quality you expect from Dunkin Donuts directly to your doorstep. 100 percent Arabica beans, from Central and South America, are grown from highly experienced farmers and roasters that adhere to strict guidelines and rigorous processes to ensure you receive the best. Only the highest quality coffee beans are selected in every batch to deliver a great-tasting brew that's perfect hot or iced. Stay fresh canister seals tightly to lock in freshness and flavor for a smooth, delicious flavor morning after morning.